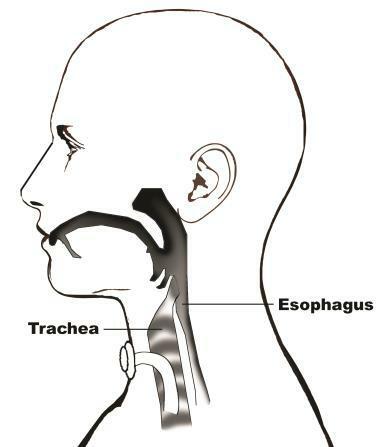 A tracheostomy is a hole in the windpipe (trachea) created by a surgeon. This hole (called a stoma) replaces a person’s nose and mouth as the pathway for breathing. A tracheostomy tube is inserted into the stoma to keep the hole open and provide an entry way into the lungs. A tracheostomy is performed to provide an airway in people who need to be on a mechanical ventilator, or who have trouble swallowing and are at risk for aspiration. Aspiration is the act of breathing in a foreign object; such as, saliva, liquids, or food. A tracheostomy is also done when a patient is unable cough up their own mucus and provides an easy way to suction mucus from the lungs. 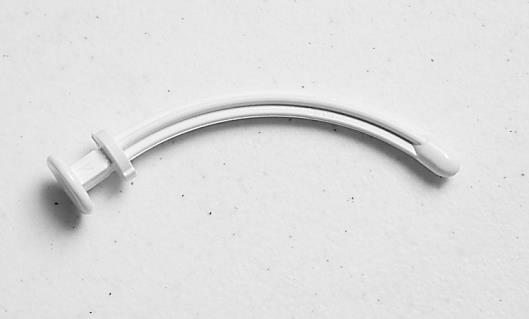 There are different types and sizes of tracheostomy tubes used for different reasons. Outer Cannula: The outer cannula is the main body of the tube. It is held in place with a Velcro strap, which wraps around the patient’s neck. The trach tube pictured here has a “cuff”. A cuff is a balloon attached around the outside of the tube. The cuff is inflated by filling the pilot balloon with air, which fills the cuff. When inflated, the cuff seals against the inside walls of the airway. A cuff is necessary when a patient is on a mechanical ventilator. Inflating the cuff during mechanical ventilation makes sure that air is entering the lungs and not escaping through the nose and mouth. The cuff also prevents aspiration of saliva in patients who have trouble swallowing. The tube then functions as a port for suctioning to clean out the lungs. 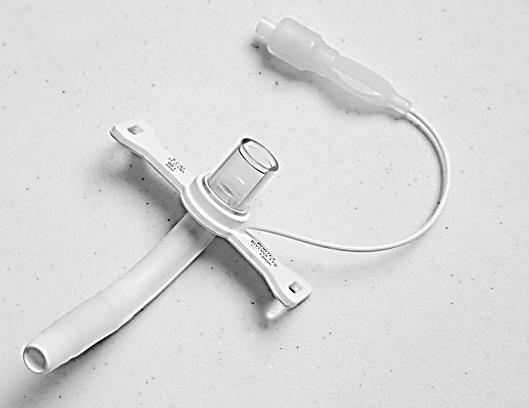 Inner Cannula: The inner cannula fits inside the trach tube and acts as a liner. 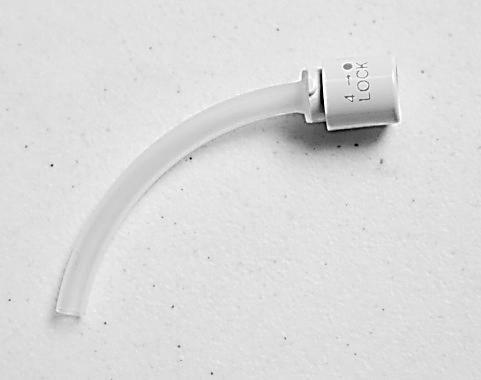 This liner can be removed and cleaned to help prevent the build-up of mucus inside the trach tube. The inner cannula locks into place to prevent accidental removal. Note: Not all tracheostomy tubes have inner cannulas. Obturator: The obturator is used when placing a trach tube or during trach changes. It is inserted into the main body of the tracheostomy tube and acts as a guide to help place the trach tube into the airway. Its smooth, rounded tip protects the inside of the airway from damage during insertion. The obturator is only used when inserting a tracheostomy tube. It must be removed as soon as the trach tube has been placed. 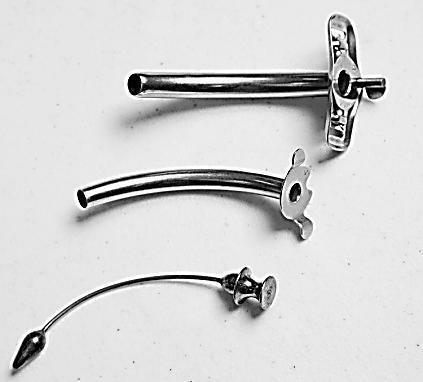 Bivona® Trach Tubes: Traditional tracheostomy tubes are generally made of rigid plastic or metal. However, Bivona® trach tubes are made of soft silicone. This allows for greater movement and comfort with less irritation. Silicone is less porous than plastic and less likely to grow bacteria. 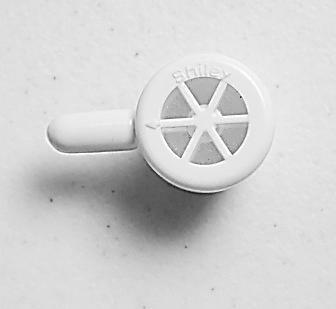 When the Bivona® cuff is deflated, it disappears against the trach tube and deflates down to the exact size of the tube. Metal Tracheostomy– Jackson Style: Metal tracheostomy tubes do not have cuffs. At Craig Hospital, we often use metal trachs when a patient will have a trach tube for a long period of time or we are considering removing a trach tube “decannulation”. 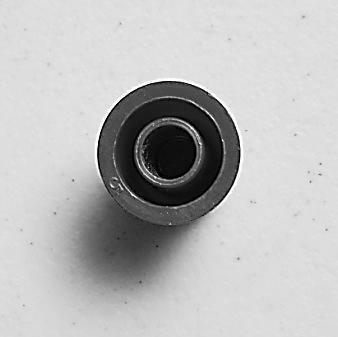 The smallest metal trach size is the shortest, smallest, and thinnest tube we offer. This will help us determine whether a patient is ready to have their trach removed. When breathing through a tracheostomy tube, the air no longer passes through the nose or mouth where it normally would be warmed, filtered, and humidified. Because of this, most trached patients require a heated-humidifier (mist) which will warm and humidify the air. A tracheostomy will interfere with a person’s ability to speak. This happens because the trach is located below the vocal cords. Air must be allowed to pass over and vibrate the vocal cords to create sound. However, with a trach tube, air moves in and out of the tube and does not reach the vocal cords. A speaking valve is a one-way valve that attaches to the end of a trach tube. It is designed to open when the patient takes a breath and close when the patient exhales. When the valve closes, it forces air up into the airway and across the vocal cords allowing for sound and speech. The patient will breathe in through the trach and exhale out through the nose and mouth. Placement of a speaking valve should initially be done by a Respiratory Therapist, Pulmonary Doctor, or Nurse Practitioner. 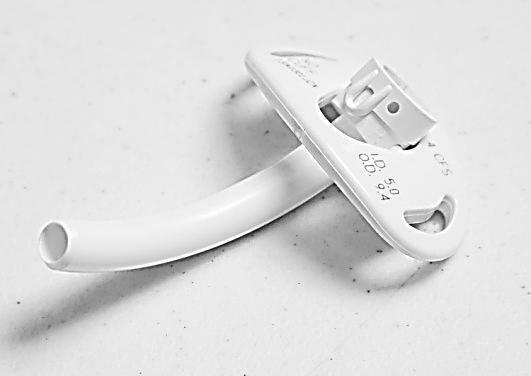 If a valve or cap is being used with a cuffed tracheostomy tube, the cuff MUST BE DEFLATED before placement of the device. Capping a patient who has an inflated cuff can result in DEATH because this would not allow a patient to breathe in, out or both. A tracheostomy cap (red cap) covers the opening of the trach tube and blocks air from entering the tube. This forces the patient to breathe in and out through their nose and mouth. This is often the last step before the trach is removed (decannulation). If the trach can be capped for a long enough time without any problems, it is probably safe to be removed. Patients on ventilators can be allowed to speak by doing partial cuff deflations. The Respiratory Therapist will deflate the cuff enough for air to leak past the tube and across the vocal cords. But, will leave enough air in the cuff to allow for proper ventilation of the patient. If the cuff were completely deflated, all of the air would escape out of the nose and mouth and would not be delivered to the lungs as a breath. Clean the tracheostomy hole (stoma) twice daily with a 50/50 mixture of sterile water and hydrogen peroxide. After the stoma is clean, place a gauze pad under the trach tube. A plastic trach tube should be replaced every two weeks. 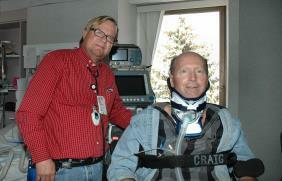 A Bivona® or a metal trach can be changed once a month. Keeping the trach site clean and replacing the tubes regularly will help keep your patient healthy and free from infection. How long will a patient have a tracheostomy tube? The length of time a tracheotomy tube stays in place depends on why it was required in the first place. For individuals on a ventilator, it will need to say in place until the patient weans from life support. If this is not possible or in cases of severe apnea (when people stop breathing), the tracheotomy tube may need to stay indefinitely. 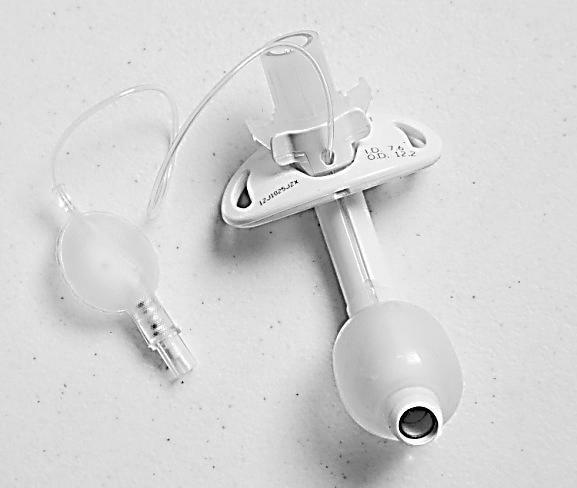 If the trach was placed because of swallow problems, airway obstruction, secretion issues or if the patient is not aware enough to protect their airway, these situations must be resolved before the tube will be removed. A tracheotomy tube can be removed if breathing or the airway improves to the point where the tube is no longer needed. During removal, the tube will simply slide out. The opening in the neck should close on its own. While the stoma is closing, it will be covered with wound dressing. Air may leak out when the individual talks or coughs, but this is normal and should improve with time. Your Nurse and Respiratory Therapist will closely monitor the stoma as it heals. A tracheostomy can seem like a scary and overwhelming process, but is often a vital step in the rehabilitation of spinal cord and traumatic brain injury. Your Respiratory Therapist will provide education and training to help you through this process.